Everyday unexpected car accidents happen all over the country in various ways. As a result of the accident, cars often suffer irreparable damage. Bodily injuries are also common and are hard to be avoided. The level of injury varies by car accident. Injuries may be serious, while others are only minor scratches. Some people walk away from the accident unharmed. This is not always the case. It is common for injuries to leave passengers disabled without the ability to work and care for themselves. If you have been in a car accident and are a victim of a back or neck injury, it is recommended for you to contact a car accident attorney. There are different levels of damage that can be caused to your back. To diagnose the severity of the back injury, accident passengers are encouraged to visit a doctor right after being involved in a car accident. Sometimes injuries are not noticeable at first. Whether you feel that you have been injured or not, you should always see a doctor after being in an accident. 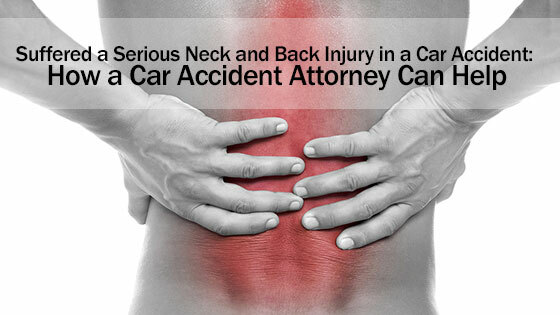 Lumbar sprains, spinal cord injuries and fractures are all common back injuries caused by automobile accidents. You are only eligible for compensation for your back injury if you are able to prove the other party involved in the accident was negligent or reckless in some way. Without having a car accident lawyer, proving this can be a challenge. In car accidents, neck injuries are one of the most common bodily damages to surface. How bad a neck injury is, is a direct result of how strong the impact was that took place between the two vehicles. The kind of automobiles involved in the collision are also an important factor. Whiplash is a neck injury that can happen at both high and low speed collisions. Whiplash is caused by the jerking motion of the neck forwards and backwards in a quick movement. How Do You Know If You Are Suffering from Whiplash? Many of the symptoms for whiplash are also related to having a concussion. Seeking medical help immediately is encouraged. You will not always notice a neck injury right after an accident. It may take a few days to notice symptoms. After speaking with a car accident attorney, you can file a lawsuit for damages. The damages that may be awarded to you will be to recompense the injuries acquired during the accident. Other compensation given may include hospital fees, future wages to be lost, bills acquired from doctor visits, physical therapy fees along with pain and sorrow. Your car accident lawyer will inform you of the validity of your claim. Once this has taken place, you will receive instructions on what the next step is in your lawsuit. Call our law offices today at any of our convenient locations and get a free consultation. Call our law offices today at any of our convenient locations and get a free consultation.